This shirt was designed for a bi-annual charity event featuring music and poetry that converts group donations into meals for the needy in North Texas and Oregon. The community based charity event called “Hootenannies” gather donations that raise funds for the North Texas and Oregon Food Banks. These charity events have brought together poets, musicians and artists from North Tx. and across the United States for over a decade to generate roughly 33,000 to 41,000 meals for the hungry in their community. 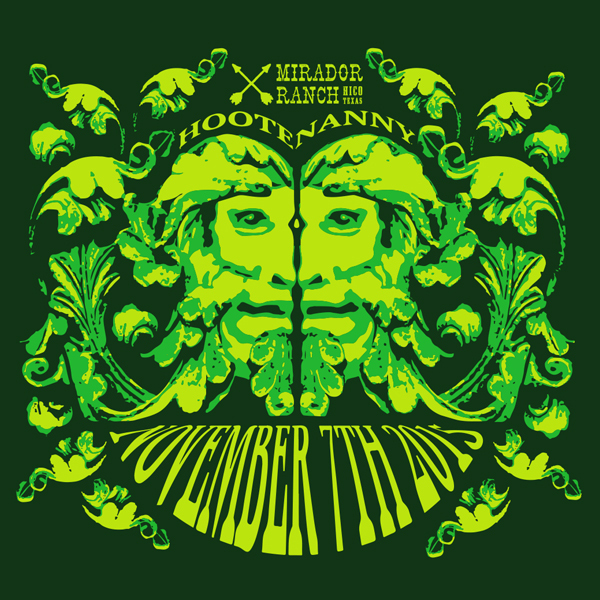 To make each Hootenanny event unique, a commemorative shirt is created. The shirt is then provided to those who make a donation. 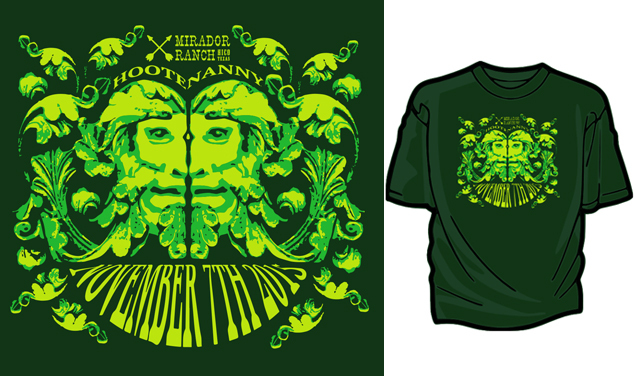 This design was intended to focus on our relationship to nature and features an image of the Green Man where he faces a reflection of himself to create the illusion of a single entity. I wanted the viewer to consider their own relationship to nature and their fellow man, a fitting contemplation for this event dedicated to helping those less fortunate. Considering the subject matter I chose to go with a mono chromatic color scheme and I presented the layout on a green shirt. It was also the first time that we decided to offer short and long sleeve shirts as well as a girlie cut T-Shirt. They were well received as usual and donations were made to both food banks. We were able to capitalize on the holiday donations and there were some ‘meal matching’ promotions going on so we were able to generate many needed holiday meals for the hungry.